#209: YES! published on May 8, 2012 Read more posts by the author of #209: YES!, MikeNo Comments on #209: YES! Mike: I have never seen a movie that made me smile more than a kid in a candy store than The Avengers. I was ginning the entire time, I laughed out loud, and I actually clapped my hands at times. All of things I don’t often do in theaters. Not only was it so much fun to see all these characters interacting together and finally seeing a continuity movie series finally happen, But it was a legitimately great film. Joss Whedon did what he does best: combine action, drama, and comedy into one incredibly fun film. Every character was written perfect with each actor in top form and everyone had their own crowning moments of awesome. The action was awe inspiring, not over the top destruction for sake of fancy cgi, but just fantastic action sequences with heart on an appropriately epic scale. The one sequence where the camera goes from Avenger-to-Avenger is amazing and has the best ending shot you can ever imagine. Also the second post credit scene: pure brilliance. 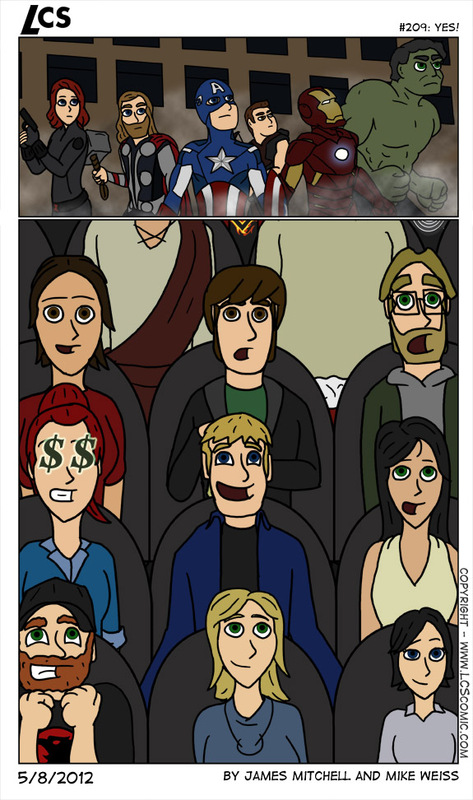 The Avengers is THE perfect movie to see if you want to have fun. So as we said last strip: See it now. RIGHT. NOW. Also this is probably the most I’ve drawn for one page and I’m damn proud of it. James: What he said. I’ve already seen the movie 3 times, I loved every second of it. Big props to Mike on the excellent page. See you Friday.